In an effort to eat a little bit cleaner, but still keep all the flavor, I have been experimenting with some of my favorite recipes over the past few months. 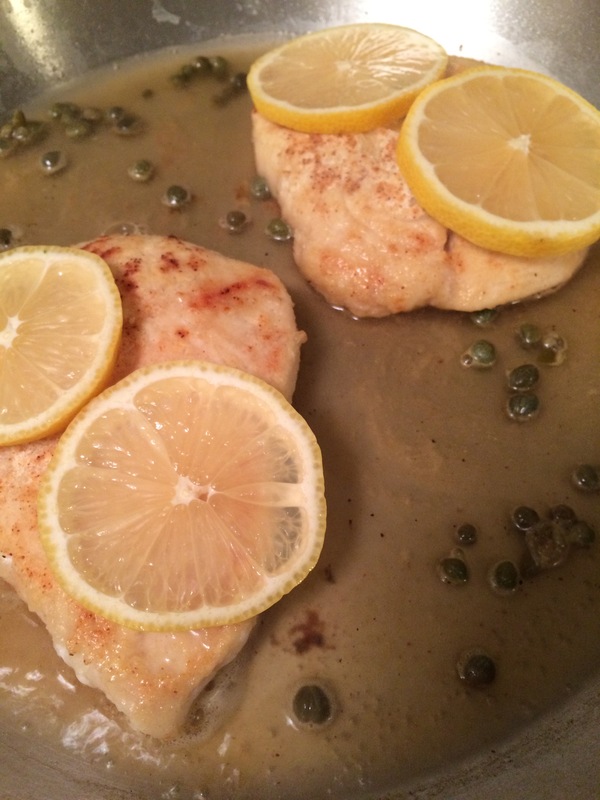 The recipe that cleaned up the best, was surprisingly chicken piccata! Normally, this recipe would have wine and a fair amount of butter but my version has neither. And yet, is still delicious! It has the vinegary tang from the capers and that bright fresh lemon flavor infused throughout. Not to mention it cooks in under 20 minutes! Using a meat mallet or rolling pin, pound the chicken flat till it is about 1/2″ thick. Dredge in mixture of flour, garlic powder, salt, and pepper. You will not use all the flour mixture at this point, really you just want a light dusting on the chicken. This helps create the sauce later. Meanwhile, heat up a large sauté pan (you will need one with a lid) over medium to medium high heat. Spray lightly with cooking spray oil (I used Pam coconut oil spray). Sear chicken about 4 minutes per side or till browned. Remove the chicken from the pan and set aside. Deglaze the pan using the chicken stock. Add the capers and chicken back into the pan. Top each piece of chicken with two slices of lemon. Cover the pan and let simmer on medium for about 10 minutes, or till chicken is cooked. At this point you can reduce down the stock if needed, but mine had cooked down plenty at this point to make a great sauce. You can also garnish with a little parsley or basil if you have it! Serve with the capers and sauce spooned over the chicken. If the sauce gets on your broccoli or asparagus, so much the better!